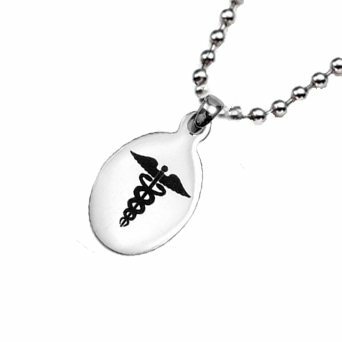 A great new oval shape - Our 316 oval stainless steel medical alert necklace features a black caduceus medical symboll and 24"- 304 stainless steel bead chain (easily cut to desired length) Product not eligible for further discounts. Engraving is done in Upper case letters, block font. Please be sure to leave appropriate spacing.